Artists invited to submit proposal for exhibition at UHW. Waterford Healing Arts Trust (WHAT) has announced an Open Call to artists based in Ireland to submit proposals for an exhibition entitled “A Better Place”, to take place at University Hospital Waterford (UHW) later this year. This annual exhibition, curated by WHAT, aims to use original artworks to make UHW a better place for all: patients, visitors and staff. The closing date to submit proposals is Tuesday 12 March at 5pm. Now in its fourth year, the “A Better Place” exhibition has grown each year, with a record 63 entries received in 2018. Artists are invited to submit two samples of their work to be considered and voted on for a full solo exhibition. These samples will be displayed at the hospital for a period of four weeks and all who view them will have an opportunity to submit their vote via a voting card. Artists are not identified during the selection process. 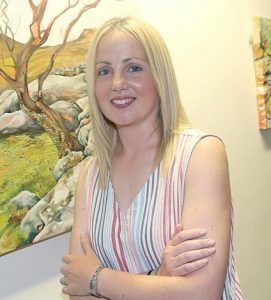 Announcing details of the Open Call, Claire Meaney, Acting Arts Director of Waterford Healing Arts Trust, said “We curate a lively programme of temporary exhibitions which offer patients, staff and visitors opportunities to access diverse contemporary art. The exhibitions are important also as they help to lift people’s spirits during what can be a difficult time and they change conversations: they prompt new exchanges between patients, staff members and visitors that are beyond the medical context of a person’s illness”. She added “People are encouraged to vote for a work not just for its aesthetic quality, but also for its positive impact, primarily on patients, within the hospital setting”.